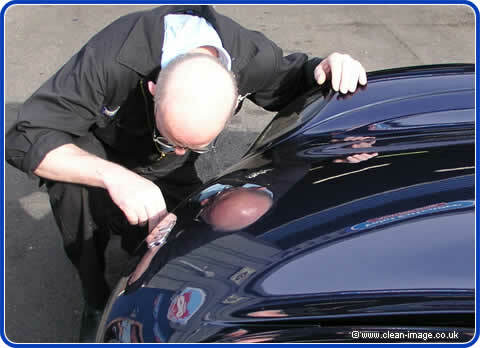 Yes, it's yet another article about buffing paintwork, and again it is the work of buffmeister Willy Winterfalk... and I told him I was determined to catch him out this time. 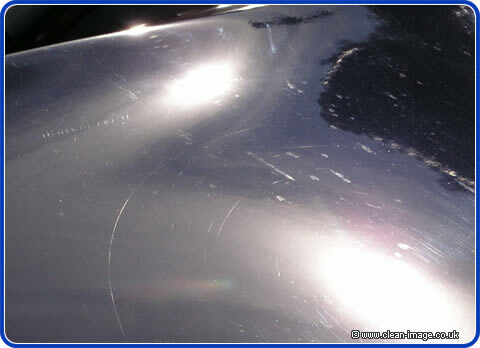 Buffing won't give you perfection, you can never get rid of all the scratches - and I really want to show the cars we have done 'warts and all'. So I told Willy that I would be following him around with the camera in order to catch the bits that he couldn't remove or didn't get quite right. "Of course, of course" he said. To really do his best on a car he needs 2-3 days dependant on the state of the car, but obviously there is a scale of economy. Our standard three stage system takes just a couple of hours and costs £80 and will make a huge improvement to any car - while Willy normally charges between £400-£600. 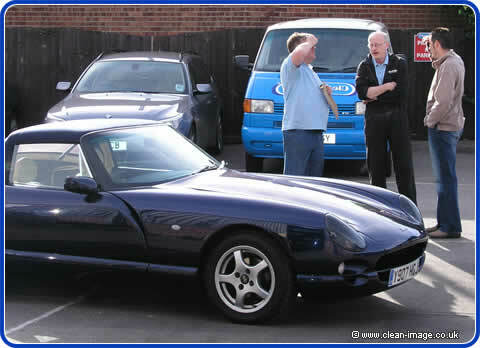 However, Willy is just here to train us this week, so when Mark Craine brought his beautiful TVR to us, we agreed a price of £269 including valet for Willy to buff the paintwork - and he had less than a day to do it instead of his normal 2 days. (We did have the car for 2 days, but most of this time was spend preparing the car for buffing and valeting the car). Willy inspects the paintwork for spider-webs (swirl marks) , oxidization, stains, acid etching and fallout. They don't get many TVRs in Sweden and so Willy was quite keen to try his techniques on a car made from composite materials. He is not a complete stranger to GRP and fiberglass materials - as already mentioned, Willy's background is in Chemical Engineering and one of his first jobs was working in the labs at International Marine Coatings who are famous for making paints of boats, so he was able to give us an education on the subject. Buffing plastic or composite panels raises interesting issues, because Willy's buffing process is geared around heat, metal panels absorb and hold heat caused by friction in the buffing process. But GRP doesn't. This means that the paint won't heat up slowly, it will heat up very quickly as there is no metal panels to take and disperse the heat. Also, there are no metal panels to hold the heat, so as soon as you take the buffing pad off the paintwork it cools down. Heat is critical to the process of removing swirl marks, so it is important to get the paint hot, yet too much heat and the paint will bind and burn. So Willy needed to experiment a fair bit, starting of with fine buffing pads and polish and working up till he found a combination that works. The overall look of the car wasn't too bad, but as can be seen from the photo above, the car was covered in micro-scratches which when catching the light cause patterns sometimes called spider webs or swirl marks. There are more photos of swirl marks on the next page.